local-npm is a Node server that acts as a local npm registry. It serves modules, caches them, and updates them whenever they change. Basically it&apos;s a local mirror, but without having to replicate the entire npm registry. This allows your npm install commands to (mostly) work offline. Also, they get faster and faster over time, as commonly-installed modules are aggressively cached. When you first npm install a module, it&apos;ll be fetched from the main npm registry. After that, the module and all its dependencies (at that version) are stored in a local database, so you can expect subsequent installs to be much faster. If you&apos;re organizing a conference/meetup/whatever, you can also share this local server with multiple people. So if your teammates are constantly installing the same modules over and over again, this can save a lot of time in the long run. local-npm is also a good way to make npm install work offline. Assuming new versions of a package haven&apos;t been published since you last installed, subsequent npm installs will all serve from the cache, without ever hitting a remote server. 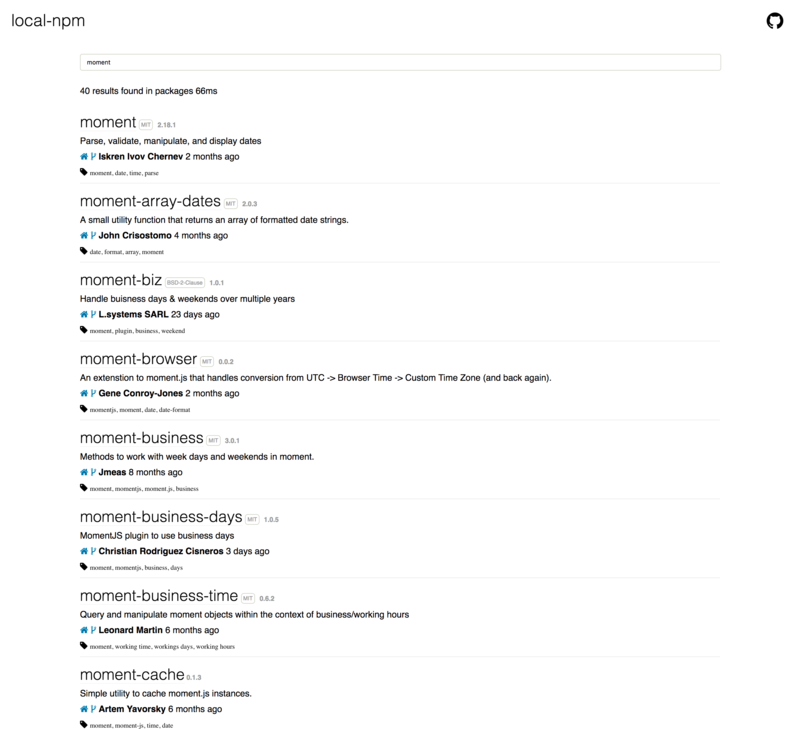 Addy Osmani has a nice post comparing local-npm to other options. The same rules as for the npm Australia mirror apply here. In this way, you can create a daisy chain of awesome. This will ensure that clients fetch tarballs from 192.168.x.x instead of 127.0.0.1. 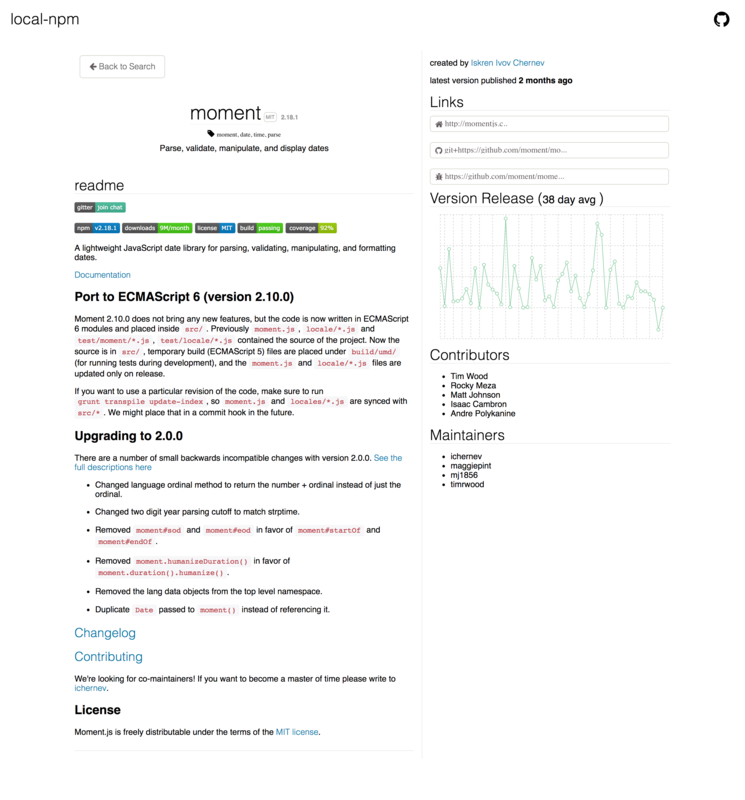 A rudimentary npm-like UI that allows you to search modules and see their descriptions can be found at http://localhost:5080/_browse. If you haven&apos;t finished replicating the remote skimdb, then not all the modules will be visible yet. Incidentally, though, local-npm does allow you to do npm login and npm publish. These commands will just be proxied to the main npm registry. For a speed test of local-npm versus regular npm, see these results. The entire "skimdb" (metadata) is replicated locally, but for the "fullfatdb" (metadata plus tarballs), only what you npm install is stored. To start from scratch, just delete whatever directory you started the server in. Note that new tarballs aren&apos;t downloaded until you explicitly npm install them, though. So e.g. if you install v1.0.0 of a package, then v1.0.1 is published, and your range says ^1.0.0, then the next npm install will fail unless you&apos;re online and can fetch the new tarball.